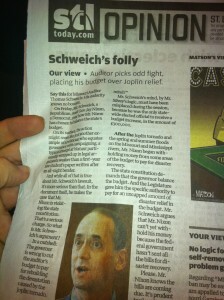 The St. Louis Post Dispatch has published a guest editorial written by State Auditor Tom Schweich defending his position in a lawsuit against Governor Nixon. 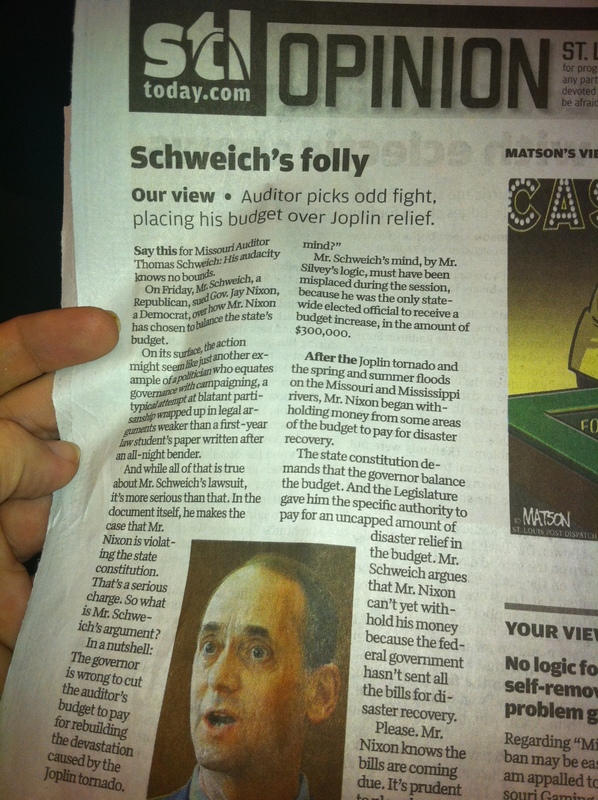 Auditor Schweich called a press conference Monday to express his outrage over an editorial published by the 'St. Louis Post Dispatch' that questioned the motives of a lawsuit against Gov. Nixon. He says the governor has exceeded his legal authority by withholding these funds before the start of the fiscal year and without evidence that actual revenues are less than revenue estimates, and reallocating the withheld funds in violation of the separation of powers. Governor Nixon says he does have the authority to withhold the funds to help Joplin and other disaster stricken areas of the state recover.